Lorenzo Giustiniani (1381-1456) was from one of Venice's most noble but especially pious families. 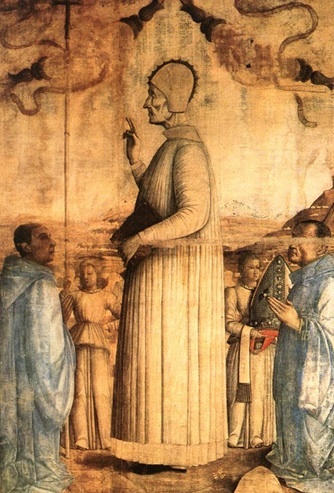 Knowing from an early age that he had a religious vocation, he became Prior General of the Canons Regular of San Giorgio in Alga and did so much to spread the order that Pope Eugene IV made him bishop of Castello in 1433; in 1451, when the Diocese of Castello (and the rest of Venice) was combined with the Patriarchate of Grado, Giustiniani was made first Patriarch of Venice. Giustiniani played an important role in guiding the state through the troubled period after 1452 and the Ottoman capture of Constantinople. He died in 1456 and is buried in San Pietro di Castello, and was canonized in 1690 (his name appears as Laurentius Justinianus on the Roman calendar).